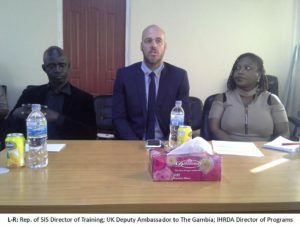 IHRDA is organizing a two-day training of trainers’ workshop for The Gambia’s State Intelligence Services (the SIS), as part of an ongoing human rights capacity-building project for the corps. The workshop that runs from 24-25 January 2018 brings together twenty-five Officers, who are receiving knowledge and skills to champion human rights education for officers and new recruits in the SIS. Speaking at the opening of the workshop, SIS Director of Training, Abdoulaye Sanno, said, “Human rights had never been incorporated in the training curriculum for the Gambia Intelligence Service; thus the authorities thought it worthwhile to solicit the assistance of competent institutions to introduce human rights education in the Service…” Mr Sanno further noted that, “The services of the persons being trained will be vital in passing on knowledge to recruits in the new training academy for the SIS”. It should be noted that this human rights capacity building program for the SIS was launched in September 2017. Other activities include two human rights workshops for eighty Officers, the participation of two SIS officers in a short human rights course in The UK, and the development of a human rights manual for the SIS. The two officers from the course in The UK are also serving as resource persons in this training of trainers’ workshop. It is expected that this project will contribute significantly to inculcating and developing a human rights culture within the SIS. The project is funded by the British Embassy in Banjul.